Dock and railway police forces have a long tradition in the use of police dogs and the North Eastern Railway Police Force at Hull Docks is credited with introducing the first police dogs in the country. Following a visit to Belgium where he had seen police dogs in action, Mr. Geddes, the Chief Goods Manager at Hull Docks, suggested to Police Superintendent Dobie that dogs would be an asset in patrolling the docks and marshalling yards. A photograph taken in 1908 at Hull Docks shows Sergeant Allinson with a muzzled airdale dog named ‘Jim’. Ten dogs from the docks were sent to France during the Great War to patrol military installations. There was no such early tradition at the South Wales ports and it was not until 1966 that a proper dog section was introduced. . There were some old kennels attached to the police house at Subway Road at Barry Docks suggesting that dogs were in use at Barry at some point though it is not clear when. Certainly a small number of airdale dogs were kept at Cardiff Docks in the 1930s but these were used for general patrol by any officer on duty. Neither the dogs nor the officers were given any formal training. Perhaps surprisingly, there is no record of police dogs being used at the South Wales Ports during the Second World War. Trained German Sheppard dogs were in regular use at Hull Docks by 1940, indeed dog handler Pc Wood and another officer, Pc Barker, were killed by a landmine during an air-raid. Superintendent Willie Voyle established the first proper dog section for the South Wales Docks Division in 1966. Initially, four officers were selected to be dog handlers; Pc.s John Mellor, John Perry, Derek Harris and Bryn Morgan. 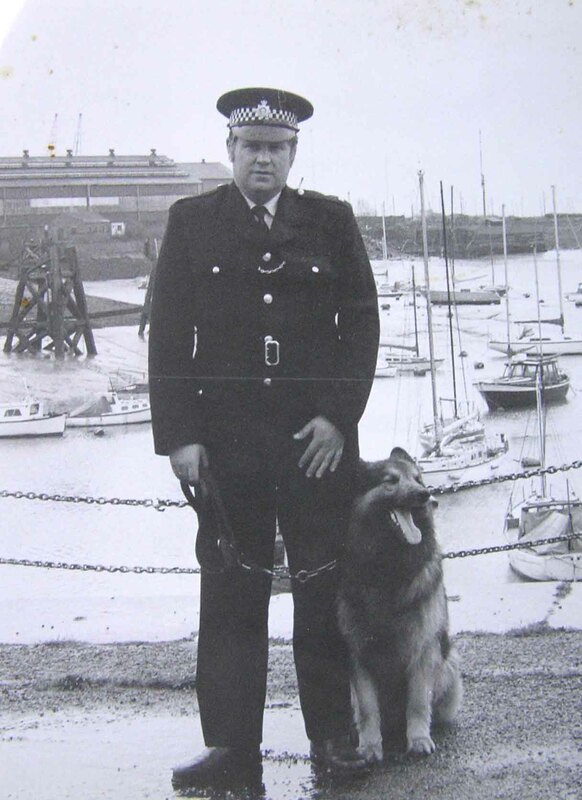 Other handlers were appointed in the Rail Division and Pc Mervyn Davies followed shortly afterwards at Swansea Docks. Training for the German Sheppard dogs and their handlers took place at the national force dog training centre then at Elstree in Hertfordshire. The dogs were certainly an asset in many circumstances, particularly in tracking from the scene of a burglary or searching the large open tracts of land. 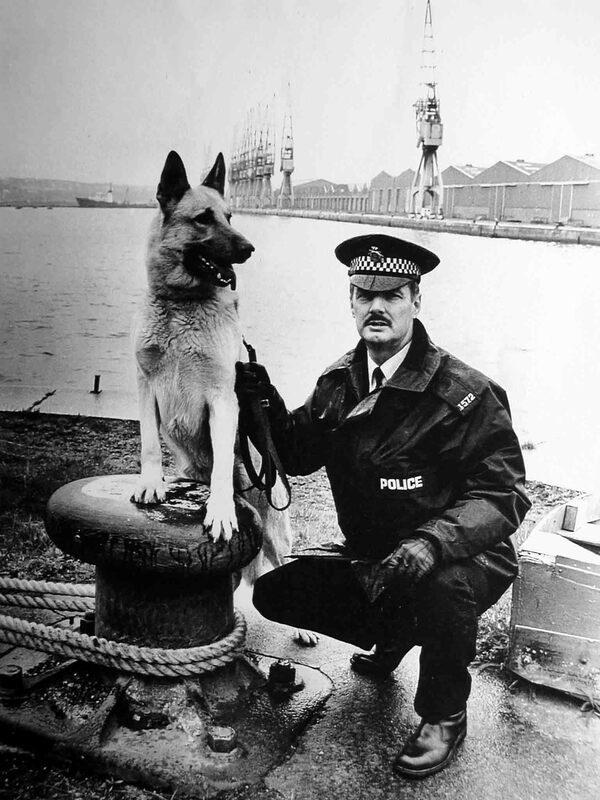 But the docks were dangerous places even for dogs- Pc Bryn Morgan’s dog was killed when it accidentally fell into a dry dock while being exercised at Newport. There can be no better illustration of the effectiveness of a well trained dog than the incident that led to Pc Allan Beddoe and his dog ‘Major’ featuring in the national news. Early in 1983, British Transport Police CID officers at Cardiff were investigating a burglary and the unlawful taking of a motor vehicle. A small engineering works in Collingdon Road had been attacked and the safe stolen. Entry had been gained to the premises through a hole in the wall made when a forklift truck had been used to smash through the brickwork. Acting on information, officers discovered the unopened safe in a disused quarry at Leckwith on the outskirts of Cardiff. Believing that the suspects would return to try to retrieve the contents, the officers set themselves up to lie in wait. Amongst them were two dog-handlers, Pc John Mellor with his dog ‘Chas’ and Pc Allan Beddoe with his four-year old German Shepherd dog, ‘Major’. Darkness was falling when, to the astonishment of the officers, two men dropped down the quarry face on a rope and began to attack the back of the safe with a hammer and crowbar. The waiting officers moved in to make the arrest, but in the darkness and confusion one of the men escaped. The other was arrested by Pc John Mellor and his dog. Pc Beddoe’s dog ‘Major’ set off in pursuit of the fleeing figure, but using the rope, the suspect scaled the 120 foot quarry face, to escape by crashing through dense woodland in the dark. Pc Beddoe tried in vain to recall ‘Major’ but he did not respond. Eventually, the officers were forced to abandon the search for the suspect and the missing police dog. Later that evening, it was reported that an alsation dog was sitting on the pavement in Penarth Road in the Grangetown area of Cardiff. It was ‘Major’ sitting on the pavement outside a house nearly five miles distant from the quarry and some four hours since the dog had gone missing. Officers gained entry and the house was searched twice without success. However, when ‘Major’ was allowed in to have another look, he found the suspect hiding behind a false panel of a wardrobe in the basement. You could almost see the grin on the dog’s face! Two days later the arrested man pleaded guilty to several criminal offences at Cardiff Magistrates Court and was sent to prison for six months. ‘Major’ had pulled off a truly remarkable track, through the quarry and adjacent woods and along busy arterial roads for a distance of five miles, all without any guidance or assistance from his handler. And when he could go no further, having been confronted by a locked door, he simply sat down and waited patiently for the cavalry to arrive. When he was interviewed, the suspect complained about the pesky dog’s persistence, explaining that he had swum across the Ely River in an attempt to shake his pursuer off but the dog had simply waded in and swum after him. An outstanding piece of police work by any estimation. ‘Major’s story was reported in both the local and national press, including the front page of the Daily Express. The handler and his dog were both later commended by the Chief Constable.